The Romanian economy is the 40st-largest economy in the world, with a $517.5 billion annual output (PPP). In recent years, Romania enjoyed some of the highest growth rates among EU countries: 6% in 2016, 7% in 2017, and 4,1% in 2018. Growth is expected to slow down to +3.8% in 2019. Extrapolating current trends, the country's GDP is projected to surpass $1,000 billion (PPP) before 2035. Romania is of the leading destinations in Central and Eastern Europe for foreign direct investment: the cumulative inward FDI in the country since 1989 totals more than $170 billion. Romania is the largest electronics producer in Central and Eastern Europe. In the past 20 years Romania has also grown into a major center for mobile technology, information security, and related hardware research Dacia automobiles. Up until the late 2000s financial crisis, the Romanian economy had been referred to as a "Tiger" due to its high growth rates and rapid development. Until 2009, Romanian economic growth was among the fastest in Europe (officially 8.4% in 2008 and more than three times the EU average). Romania is rich in iron ore, oil, salt, uranium, nickel, copper and natural gas. The country is a regional leader in multiple fields, such as IT and motor vehicle production. Bucharest, the capital city, is one of the leading financial and industrial centres in Eastern Europe. The top 10 exports of Romania are vehicles, machinery, chemical goods, electronic products, electrical equipment, pharmaceuticals, transport equipment, basic metals, food products, and rubber and plastics. Imports of goods and services increased 9.3%, while exports grew 7.6% in 2016, as compared to 2015. Exports of goods and services are expected to grow by 5.6% in 2017, while imports are seen increasing by 8.5%, according to the latest CNP (National Prognosis Commission) projections . Industry in Romania generated 33.6% of the local gross domestic product (GDP) in the first half of 2018. After World War I, the application of radical agricultural reforms and the passing of a new constitution created a democratic framework and allowed for quick economic growth (industrial production doubled between 1923–1938, despite the effects of the Great Depression). With oil production of 7.2 million tons in 1937, Romania ranked second in Europe and seventh in the world. The oil extracted from Romania was essential for the German war campaigns. Before World War II, Romania was Europe's second-largest food producer. After the Second World War, Romania became a member of the Eastern Bloc, and switched to a Soviet-style command economy. During this period the country experienced rapid industrialization in an attempt to create a "multilaterally developed socialist society". Economic growth was further fueled by foreign credits in the 1970s, but this eventually led to a growing foreign debt, which peaked at $11–12 billion. Romania's debt was largely paid off during the 1980s by implementing severe austerity measures which deprived Romanians of basic consumer goods. In 1989, before the Romanian Revolution, Romania had a GDP of about 800 billion lei, or $53.6 billion. Around 58% of the country's gross national income came from industry, and another 15% came from agriculture. The minimum wage was 2,000 lei, or $135. Privatization of industry started with the 1992 transfer of 30% of the shares of some 6,000 state-owned enterprises to five private ownership funds, in which each adult citizen received certificates of ownership. The remaining 70% ownership of the enterprises was transferred to a state ownership fund, with a mandate to sell off its shares at the rate of at least 10% per year. The privatization law also called for direct sale of some 30 specially selected enterprises and the sale of "assets" (i.e., commercially viable component units) of larger enterprises. As of 2008, inflation stood at 7.8%, up from 4.8% in 2007 estimated by the BNR at coming within 6% for the year 2006 (the year-on-year CPI, published in March 2007, is 3.66%). Also, since 2001, the economy has grown steadily at around 6–8%. Therefore, the PPP per capita GDP of Romania in 2008 was estimated to be between $12,200 and $14,064. Financial and technical assistance continued to flow in from the U.S., European Union, other industrial nations, and international financial institutions facilitating Romania's reintegration into the world economy. The International Monetary Fund (IMF), World Bank (IBRD), the European Bank for Reconstruction and Development (EBRD), and the U.S. Agency for International Development (USAID) all had programs and resident representatives in Romania. Romania also attracted foreign direct investment, which in 2008 rose to $72 billion. Romania was the largest U.S. trading partner in Central-Eastern Europe until Ceauşescu's 1988 renunciation of Most Favored Nation (non-discriminatory) trading status, the latter of which resulted in high U.S. tariffs on Romanian products. Congress approved restoration of the MFN status effective 8 November 1993, as part of a new bilateral trade agreement. Tariffs on most Romanian products dropped to zero in February 1994 with the inclusion of Romania in the Generalized System of Preferences (GSP). Major Romanian exports to the U.S. include shoes and clothing, steel, and chemicals. Romania signed an Association Agreement with the EU in 1992 and a free trade agreement with the European Free Trade Association (EFTA) in 1993, codifying Romania's access to European markets and creating the basic framework for further economic integration. At the Helsinki Summit in December 1999, the European Union invited Romania to formally begin accession negotiations. In 2002, the target date of 2007 was set for Romania, along with Bulgaria, for its accession efforts. This was confirmed in 2003 at the Thessaloniki Summit and then in early 2005 Romania and Bulgaria signed the adherence treaty to EU. They formally joined the EU on 1 January 2007. During the latter part of the Ceauşescu period, Romania earned significant credits from several Arab countries, notably Iraq, for work related to the oil industry. In August 2005, Romania agreed to forgive 43% of the US$1.7 billion debt owed by an Iraq still largely occupied by the military forces of the U.S.-led "Coalition of the Willing", making Romania the first country outside of the Paris Club of wealthy creditor nations to forgive Iraqi debts. Growth in 2000–07 was supported by exports to the EU, primarily to Italy and Germany, and a strong recovery of foreign and domestic investment. Domestic demand is playing an ever more important role in underpinning growth as interest rates drop and the availability of credit cards and mortgages increases. Current account deficits of around 2% of GDP are beginning to decline as demand for Romanian products in the European Union increases. Accession to the EU gives further impetus and direction to structural reform. In early 2004 the government passed increases in the value-added tax (VAT) and tightened eligibility for social benefits with the intention to bring the public finance gap down to 4% of GDP by 2006, but more difficult pension and healthcare reforms will have to wait until after the next elections. Privatization of the state-owned bank Banca Comercială Română took place in 2005. Intensified restructuring among large enterprises, improvements in the financial sector, and effective use of available EU funds is expected to accelerate economic growth. However, the Romanian economy was affected by the financial crisis of 2007–08 and contracted in 2009. The level of investment remains above EU average. Investment accounts for almost 25% of GDP in Romania as opposed to 19% of GDP in the EU, in 2016. On 1 January 2007 Romania entered the EU. This led to some immediate international trade liberalization. Romania is part of the European single market which represents more than 508 million consumers. 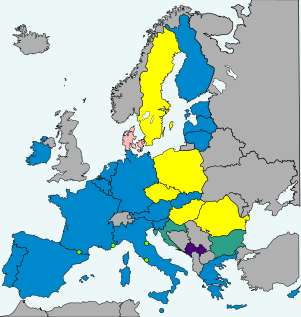 Several domestic commercial policies are determined by agreements among European Union members and by EU legislation. This is to be contrasted with enormous current account deficits. Low interest rates guarantee availability of funds for investment and consumption. For example, a boom in the real estate market started around 2000 and has not subsided yet. At the same time annual inflation in the economy is variable and during the mid-2000s (2003–2008) has seen a low of 2.3% and high of 7.8%. In the winter of 2004 the government introduced a flat tax of 16% that was introduced on 1 January 2005. This is done in hope for higher GDP growth and greater tax collection rates. The reform, which some called a "revolution" in taxation, was met with mild discussions and some protests by affected working classes. Romania subsequently enjoyed the lowest fiscal burden in the European Union, until Bulgaria also switched to a flat tax of 10% in 2007. The accession of Romania and Bulgaria to the European Union has given the Union access to the Black Sea. Major industries include food processing, pharmaceuticals, motor vehicles, information technology, chemicals, metallurgy, machinery, electrical goods, and tourism. Romania posted an economic growth of 6 percent in 2016, the biggest among European Union member states. According to Bloomberg, the country’s economic growth advanced at the fastest pace since 2008. It is now considered the next tech-startup hub country in EU. Nowadays, that Romania’s digital infrastructure ranks higher than other eastern and central European countries makes it an attractive place to start a tech business. In the Romanian press the economy has been referred to as the "Tiger of the East" during the 2000s. Romania is a country of considerable economic potential: over 10 million hectares of agricultural land, diverse energy sources (coal, oil, natural gas, hydro, nuclear and wind), a substantial, if aging, manufacturing base and opportunities for expanded development in tourism on the Black Sea and in the mountains. Net investments in Romania’s economy totaled RON 33.6 billion (EUR 7.2 billion) in the first half of 2018, up by 5.8% compared to the same period of 2017, according to data released by the National Statistics Institute (INS). The planned national budget for 2017 is 422 billion lei ($103 billion), with an estimated budget deficit to GDP of 1.1%. GDP growth reached 8.3% in 2006 according to the statistical office of the Romania (the year-to-year growth amounted to unexpected 9.8% in the 3rd quarter of 2006 and stayed high at 9.5% year-to-year change in the 4th quarter of 2006), and 8.0% in 2007. In the first nine months of the year 2017, the Romanian GDP grew by 7% on gross series and by 6.9 percent on seasonally adjusted series. Romania has growing middle and upper classes with relatively high per capita incomes. World Bank estimated that in 2002 99% of the urban and 94% of the rural population had access to electricity. In 2004, 91% of the urban and only 16% of the rural population had access to improved water supply and 94% of the urban population had access to improved sanitation. In 2017 there were about 22.5 million mobile phone users in Romania and about 18 million with internet access. In March 2017, the gross average monthly wage was RON 3,256 (€716), and the net average monthly wage was RON 2,342 (€515). Countries tend to benefit from sharing borders with developed markets as this facilitates trade and development. Below is a table of Romania's neighboring countries, their GDP per capita, and trade values between the pairs. In 2010, as little as 10.94pc of Romanian exports went to its neighbors; while 14.06pc of imports came from these five countries. For comparison, Germany alone accounted for 16.83pc of Romania's exports and 15.91pc of its imports. The ministry’s proposal is to increase the minimum gross wage in the economy to RON 2,080 (EUR 446) starting December 1, 2018. For employees working on positions that require upper education, the minimum gross salary will be RON 2,350 (EUR 504). The same minimum wage will apply to employees with a seniority of over 15 years. In 2018, the median wealth per adult in Romania was estimated by Credit Suisse at USD 6,658. Average wealth per adult was USD 20,321. 62% of the 15.6 million Romanian adults had a wealth of less than USD 10,000. Romania is the most popular tourist destination from Central and Eastern Europe with more than 15.7 million domestic and foreign tourists in 2018. This figure excludes people staying less than 24 hours in Romania, such as eastearn Europeans crossing Romania on their way to Asia or South Europe during the summer. Romania is home to cities of much cultural interest (Bucharest being the foremost), beaches and seaside resorts, ski resorts, and rural regions that many enjoy for their beauty and tranquillity. Romania also attracts many religious pilgrims, which hosts several thousands visitors a year. The leu (pronounced [ˈlew]), plural: lei ([ˈlej]); (ISO 4217 code RON; numeric code 946), "leo" (lion) in English is the currency of Romania. It is subdivided into 100 bani (singular: ban). On 1 July 2005, Romania underwent a currency reform, switching from the previous leu (ROL) to a new leu (RON). 1 RON is equal to 10,000 ROL. Romania joined the European Union on 1 January 2007 and initially hoped to adopt the euro in 2014, but with the deepening of the Euro crisis and with its own problems, such as a low workforce productivity, postponed its adoption plans indefinitely. According to Bloomberg, the Romanian currency is the third-best performer against the euro in 2016 among currencies in CEE area, gaining 1.4 percent. Romania, as a member state of the European Union, is required to adopt the common European currency, the Euro. For this reason Romania must fulfil the five Maastricht criteria, of which it met two as of May 2018. ^ a b c d e The maximum allowed change in rate is ± 2.25% for Denmark. Romania is an oil and gas producer. The pipeline network in Romania included 2,427 km for crude oil, 3,850 km for petroleum products, and 3,508 km for natural gas in 2006. Several major new pipelines are planned, especially the Nabucco Pipeline for Caspian oilfields, the longest one in the world. Romania could cash in four billion dollars from the Constanta-Trieste pipeline. Romania has considerable[vague] natural resources for a country of its size, including coal, iron ore, copper, chromium, uranium, antimony, mercury, gold, barite, borate, celestine (strontium), emery, feldspar, limestone, magnesite, marble, perlite, pumice, pyrites (sulfur), clay, arable land and hydropower. Romania's mineral production is adequate to supply its manufacturing output. Energy needs are also met by importing bituminous and anthracite coal and crude petroleum. In 2007 approximately 34 million tons of coal, approximately 4,000 tons of tungsten, 565,000 tons of iron ore, and 47,000 tons of zinc ore were mined. Lesser amounts of copper, lead, molybdenum, gold, silver, kaolin, and fluorite also were mined. The energy sector is dominated by state-owned companies such as Termoelectrica, Hidroelectrica and Nuclearelectrica. Fossil fuels are the country's primary source of energy, followed by hydroelectric power. Due to dependency on oil and gas imports from Russia, the country has placed an increasingly heavy emphasis on nuclear energy since the 1980s. The Cernavodă Nuclear Power Plant is the only one of its kind in Romania, although there are plans to build a second one in Transylvania, possibly after 2020. For domestic heating and cooking 48% of rural and small-town households use directly burned solid fuel (almost exclusively domestically produced wood) as the main energy source. Wind power had an installed capacity of 76 MW in 2008, and the country has the largest wind power potential in Southeast Europe, with Dobruja listed as the second-best place in Europe to construct wind farms. As a result, there are currently[when?] investor connection requests for over 12,000 MW. There are also plans to build a number of solar power stations, such as the Covaci Solar Park, which will be one of the largest in the world. Of the electricity generated in 2007, 13.1 percent came from nuclear plants then in operation, 41.69 percent from thermal plants (oil and coal), and 25.8 percent from hydroelectric sites. The volume of traffic in Romania, especially goods transportation, has increased in recent years due to its strategic location in South-East Europe. In the past few decades, much of the freight traffic shifted from rail to road. A further strong increase of traffic is expected in the future. As of June 2015, 694 km of motorways are in use with Timisoara-Lugoj 26 km also to be finished in 2015, Lugoj-Deva to be finished in 2016 while Sibiu-Pitesti is still tendering. The railway network, which was significantly expanded during the Communist years, is the fourth largest in Europe. Bucharest is the only city in Romania which has an underground railway system, comprising both the Bucharest Metro and the light rail system managed by Regia Autonomă de Transport Bucureşti. Although construction was planned to begin in 1941, due to geo-political factors, the Bucharest Metro was only opened in 1979. Now it is one of the most accessed systems of the Bucharest public transport network with an average ridership of 800,000 passengers during the workweek. In total, the network is 71 km long and has 53 stations. Romania has become a natural gas exporter. Romanian Scientist, Lazar Edeleanu, had managed, for the first time in the world, to refine oil based products with sulphur dioxide, in other words separation from the oil of some hydrocarbon groups, without their chemical alteration. Agriculture employs about 29% of the population (one of the highest rates in Europe), and contributes about 8.1% of GDP. The Bărăgan is characterized by large wheat farms. Dairy products, pork, poultry, and apple production are concentrated in the western region. Beef production is located in central Romania, while the production of fruits, vegetables, and wine ranges from central to southern Romania. Romania is a large producer of many agricultural products and is currently expanding its forestry and fishery industries. The implementation of the reforms and the Uruguay Round of the General Agreement on Tariffs and Trade (GATT) have resulted in reforms in the agricultural sector of the economy. There has been a large scale decrease in employment in the fishing industry within Romania due to the EU's Common Fisheries Policy, which places restrictions on the total tonnage of catch that can be landed, caused by overfishing in the Black Sea. In tandem with the decline of sea-fishing, commercial fish farms – especially in salmon, have increased in prominence in the rivers and lochs of the east of Romania. Inland waters are rich in fresh water fish such as salmon, trout, and in particular, carp which traditionally has been the most popular fish, including its eggs (icre), fresh or canned. In 2004 Romania enjoyed one of the largest world market share in machine tools (5.3%). Romanian-based companies such as Dacia, Petrom, Rompetrol, Bitdefender, Romstal and Mobexpert have expanded operations throughout the region. However, small- to medium-sized manufacturing firms form the bulk of Romania's industrial sector. Romania's industrial output is expected to advance 9% in 2007, while agriculture output is projected to grow 12%. Final consumption is also expected to increase by 11% overall – individual consumption by 14.4% and collective consumption by 10.4%. Domestic demand is expected to go up 12.7%. Industrial output growth was 6.9% year-on-year in December 2009, making it the highest in the EU-27 zone which averaged −1.9%. Romania has the third-highest percentage of women working in information and communications technologies (ICT) in Europe. 29% of their workforce is made up of women. The largest employer is the retail sector, employing almost 12% of Romanians. The retail industry is mainly concentrated in a relatively small number of chain stores clustered together in shopping malls. In recent years the rise of big-box stores, such as Cora (hypermarket) (of the France) and Carrefour (a subsidiary of the French), have led to fewer workers in this sector and a migration of retail jobs to the suburbs. Romania is aggressively promoting and developing its biotechnology industry. Hundred of millions of dollars were invested into the sector to build up infrastructure, fund research and development and to recruit top international scientists to Romania. Romania features one of the world’s newest competitive bio-industries, in key areas as pharmacogenomics, protein engineering, glyco-engineering, tissue engineering, bio-informatics, genome medicine and preventive medicine. Romania is devoting substantial resources to developing universities and R&D facilities, increasing bioventure startups, growing bio-clusters (communities of biotechnology companies and institutions) and developing human resources, all with the goal of making it one of the world’s most advanced biotechnology regions. The strength of the Romanian economy varies from region to region. GDP, and GDP per capita is highest in Bucharest. The following table shows the GDP (2015) per capita of the 4 counties and the capital city, with data supplied by CNP. The highest GDP per capita is found in Bucharest and surrounding Ilfov County. Values well above the national average are found in Timiş, Argeş, Braşov, Cluj, Constanţa, Sibiu and Prahova. Values well below the national average are found in: Vaslui, Botoşani, Călăraşi, Neamţ, Vrancea, Suceava, Giurgiu, Mehedinţi, Olt and Teleorman. A chart of Romania's export products. Italy is Romania's largest trading partner; two-way trade totaled some $22.6 billion in 2007. The principal exports from Italy to Romania include computers, integrated circuits, aircraft parts and other defense equipment, wheat, and automobiles, along with remittances. Romania's chief exports to Italy include cut diamonds, jewelry, integrated circuits, printing machinery, and telecommunications equipment. 2.8% of the country's GDP is derived from Agricultural activity. While Romania imports substantial quantities of grain, it is largely self-sufficient in other agricultural products and food stuffs, due to the fact that food must be regulated for sale in the Romania retail market, and hence imports almost no food products from other countries. Romania imported in 2006 food products of 2.4 billion euros, up almost 20% versus 2005, when the imports were worth slightly more than 2 billion euros. The EU is Romania's main partner in the trade with agri-food products. The exports to this destination represent 64%, and the imports from the EU countries represent 54%. Other important partners are the CEFTA countries, Turkey, Republic of Moldova and the USA. Despite a decline of the arms industry in the post-communist era, Romania is a significant exporter of military equipment, accounting for 3–4% of the world total in 2007. EU members are represented by a single official at the World Trade Organization. During the first trimester of 2010, Romanian exports increased by 21%, one of the largest rates in the European Union, surpassed only by Malta. The trade deficit currently stands at roughly 2 billion EUR, the eighth largest in the EU. ^ a b c d e f g h "World Economic Outlook Database, April 2019". IMF.org. International Monetary Fund. Retrieved 11 April 2019. ^ a b c d e f g h i j k "CIA World Factbook". CIA.gov. Central Intelligence Agency. Retrieved 20 January 2019. ^ "At-risk-of-poverty rate by NUTS 2 regions". ec.europa.eu. Retrieved 10 February 2019. ^ "ANALIZA Familia Ionescu si rata saraciei la romani. Distributia saraciei in functie de zona, de numarul copiilor, dupa forma de proprietate (proprietar vs. chiriasi). Una peste alta, Statistica a numarat saracii Romaniei: sunt 4,77 milioane - Hotnews Mobile". m.HotNews.ro. Retrieved 24 September 2017. ^ "Gini coefficient of equivalised disposable income - EU-SILC surveys". ec.europa.eu. Eurostat. Retrieved 16 March 2019. ^ a b c d "The World Factbook". Retrieved 16 September 2014. ^ "Ease of Doing Business in Romania". DoingBusiness.org. Retrieved 21 November 2017. ^ a b "The World Factbook — Central Intelligence Agency". www.CIA.gov. Retrieved 4 March 2018. ^ "Export Partners of Romania". CIA World Factbook. 2018. Retrieved 14 February 2018. ^ "Import Partners of Romania". CIA World Factbook. 2018. Retrieved 14 February 2018. ^ "Sovereigns rating list". Standard & Poor's. Retrieved 13 April 2014. ^ a b Rogers, Simon; Sedghi, Ami (15 April 2011). "How Fitch, Moody's and S&P rate each country's credit rating". The Guardian. London. Retrieved 28 May 2011. ^ "Moody's changes outlook on Romania's Baa3 ratings to positive; affirms ratings". Moody's. Retrieved 11 December 2015. ^ "Scope downgrades Romania's credit rating to BBB- from BBB, Outlook remains Negative". Scope Ratings. Retrieved 19 October 2018. ^ "World Economic Outlook Database October 2009 -- WEO Groups and Aggregates Information". Retrieved 16 September 2014. ^ "The World Factbook". Retrieved 16 September 2014. ^ "Romania, the European Tiger - Invest Romania". InvestRomania.gov.ro. Retrieved 24 September 2017. ^ "Poland and Romania: Two tigers of Eastern Europe - Nine O`Clock". www.NineOclock.ro. Retrieved 24 September 2017. ^ "Archived copy". Archived from the original on 13 May 2008. Retrieved 13 May 2008. CS1 maint: Archived copy as title (link) PIB-ul a crescut cu 7.5% in T1, iar anul agricol bun ar putea duce cresterea la peste 8%. ^ "Statistic definitions" (PDF). OICA.net. Retrieved 24 September 2017. ^ "BCR: Romania poate adopta euro in 2014 23904". Retrieved 16 September 2014. ^ "Romanian finmin analysts keep 2017 GDP growth forecast at 5.2%". SeeNews.com. Retrieved 24 September 2017. ^ "his1". Archived from the original on 3 March 2016. Retrieved 3 March 2015. ^ "VIDEO Înregistrare senzaţională cu Hitler: "Fără petrolul din România nu aş fi atacat niciodată URSS-ul"". adevarul.ro. Retrieved 16 September 2014. ^ "Business in Romania: a country that's fast off the Bloc – Two years of EU membership have transformed the business face of Romania and savvy UK firms are reaping the rewards. Paul Bray reports". The Daily Telegraph. London. 24 February 2010. Retrieved 1 May 2010. ^ "GDP – per capita (PPP)". Retrieved 16 September 2014. ^ Data refer to the year 2008. PPP GDP 2008 & Population 2008, World Development Indicators database, World Bank, 15 September 2009. Note: Per capita values were obtained by dividing the PPP GDP data by the Population data. ^ "Index of /". Retrieved 3 March 2015. ^ "The European Semester" (PDF). European Commission - European Commission. Retrieved 24 September 2017. ^ "Eurostat: Romania posts biggest economic growth in EU in 2016 Q2". Business-Review.eu. 12 August 2016. Retrieved 24 September 2017. ^ a b "One of the poorest countries in the EU could be its next tech-startup hub". QZ.com. Retrieved 24 September 2017. ^ "See Table 4.1" (PDF). WorldBank.org. Retrieved 24 September 2017. ^ "Earnings - since 1991, the monthly series". Romanian National Institute of Statistics. Retrieved 5 June 2017. ^ "Import origins of Romania (2010)". The Observatory of Economic Complexity. Retrieved 24 September 2017. ^ "Export destinations of Romania (2010)". The Observatory of Economic Complexity. Retrieved 24 September 2017. ^ "GDP per capita, PPP (current international $) - Data". data.WorldBank.org. Retrieved 24 September 2018. ^ "Romania hopes to introduce euro in 2014". Hotnews.ro. 26 January 2007. Retrieved 14 August 2007. ^ Banking News (22 June 2012). "Croitoru (BNR): Adoptarea monedei euro, un orizont indepartat". Retrieved 22 July 2012. ^ Cite error: The named reference business-review.eu was invoked but never defined (see the help page). ^ "The corrective arm/ Excessive Deficit Procedure". European Commission. Retrieved 2 June 2018. ^ "General government gross debt (EDP concept), consolidated - annual data". Eurostat. Retrieved 2 June 2018. ^ "ERM II – the EU's Exchange Rate Mechanism". European Commission. Retrieved 2 June 2018. ^ a b c d "Convergence Report May 2012" (PDF). European Central Bank. May 2012. Retrieved 20 January 2013. ^ "Convergence Report - 2012" (PDF). European Commission. March 2012. Retrieved 26 September 2014. ^ a b "European economic forecast - spring 2012" (PDF). European Commission. 1 May 2012. Retrieved 1 September 2012. ^ a b c "Convergence Report" (PDF). European Central Bank. June 2013. Retrieved 17 June 2013. ^ "Convergence Report - 2013" (PDF). European Commission. March 2013. Retrieved 26 September 2014. ^ a b "European economic forecast - spring 2013" (PDF). European Commission. February 2013. Retrieved 4 July 2014. ^ a b c d "Convergence Report" (PDF). European Central Bank. June 2014. Retrieved 5 July 2014. ^ a b c d "Convergence Report" (PDF). European Central Bank. June 2016. Retrieved 7 June 2016. ^ "Convergence Report - June 2016" (PDF). European Commission. June 2016. Retrieved 7 June 2016. ^ a b c d "Convergence Report 2018". European Central Bank. 22 May 2018. Retrieved 2 June 2018. ^ "Convergence Report - May 208". European Commission. May 2018. Retrieved 2 June 2018. ^ Romania could cash in four billion dollars from the Constanta-Trieste pipeline. Pumping oil could pay off in Romania as benefits from the Constanta-Trieste pipeline could amount to more than four billion dollars. The benefits could range from 2.27 to 4.39 billion dollars over 20 years, depending on the capacity of the new oleo duct, according to Hill International's feasibility study. ^ "Romania contruieste a doua centrala nucleara". Euractiv.ro. Retrieved 16 September 2014. ^ "Global Alliance for Clean Cookstoves". CleanCookstoves.org. Archived from the original on 24 October 2014. Retrieved 24 September 2017. ^ "Dobrogea, pe locul doi în Europa ca potenţial eolian". Dobrogea, pe locul doi în Europa ca potenţial eolian (in Romanian). Evenimentul Zilei. 5 February 2009. Retrieved 5 February 2009. ^ "Portalul national de Administratie Publica". Retrieved 16 September 2014. ^ "RAD - Network Access & Telecommunications Solutions". Archived from the original on 4 August 2014. Retrieved 16 September 2014. ^ "Bucharest Metrorex - Railway Technology". Retrieved 16 September 2014. ^ "METROREX". Retrieved 16 September 2014. ^ "Romania's Black Sea natural gas production to start in 2018 (official) – AGERPRES". www.AgerPres.ro. Archived from the original on 24 September 2017. Retrieved 24 September 2017. ^ "Oil and Gas Industry in Romania - ROPEPCA - Romanian Petroleum Exploration and Production Companies Association". www.Ropepca.ro. Retrieved 24 September 2017. ^ "Romania reports highest December 2009 industrial output growth in EU27 - FINANCIARUL - ultimele stiri din Finante, Banci, Economie, Imobiliare si IT". Retrieved 16 September 2014. ^ a b "TOPUL celor mai bogate 5 judete din Romania dupa PIB-ul pe cap de locuitor". Retrieved 30 March 2016. ^ "TOPUL celor mai bogate 5 judete din Romania dupa PIB-ul pe cap de locuitor". March 2015. Retrieved 30 March 2016. ^ "România ocupă locul doi în UE după creşterea exporturilor din primul trimestru - Mediafax". Mediafax.ro. Retrieved 16 September 2014. ^ a b c "IT and telecommunications in Central and Eastern Europe". Archived from the original on 11 October 2013. Retrieved 16 September 2014. Wikimedia Commons has media related to Economy of Romania. While the Hungarian government has been planning since 2003 to replace the Hungarian forint with the euro, as of 2014, there is no target date and the forint is not part of the European Exchange Rate Mechanism. An economic study in 2008 has found that the adoption of the euro would increase foreign investment in Hungary by 30%, although current governor of the Hungarian National Bank (MNB) and former Minister of the National Economy György Matolcsy said they did not want to give up the country's independence regarding corporate tax matters. Romania is required by its EU accession agreement to replace the current national currency, the Romanian leu, with the euro, as soon as Romania fulfills all of the six nominal euro convergence criteria. The leu is not yet part of the European Exchange Rate Mechanism, of which minimum two years of stable membership is one of the six nominal convergence criteria to comply with to qualify for euro adoption. The current Romanian government in addition established a self-imposed criteria to reach a certain level of "real convergence", as a steering anchor to decide the appropriate target year for ERM II-membership and euro adoption. As of March 2018, the scheduled date for euro adoption in Romania is 2024, according to Liviu Dragnea, head of the ruling Party of Social Democrats. The United Kingdom has never sought to adopt the euro as its official currency for the duration of its membership of the European Union (EU), and secured an opt-out at the euro's creation via the Maastricht Treaty in 1992. Polls have shown that the majority of British people have been against adopting the euro, and in a June 2016 referendum the UK voted to withdraw from the EU which would virtually eliminate the chance of any future adoption. Despite never being a member of the eurozone, the currency is used in the UK's Cypriot territories and as a secondary currency in Gibraltar; furthermore, London is home to the majority of the euro's clearing houses. Romania has a developing, upper-middle income market economy, the 17th largest in the European Union by total nominal GDP and the 11th largest based on purchasing power parity. The country is a regional leader in multiple fields, such as IT and motor vehicle production.